Scientific Name(s): Ugni molinae Turcz. 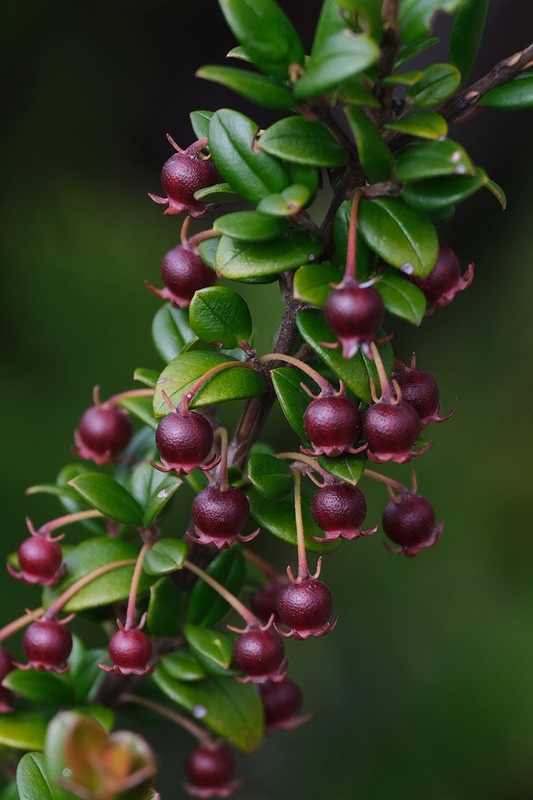 Flavour descriptions for the fruit of Ugni molinae range from “tastes of wild strawberries” to “mildly spicy-guava like”. I would have liked to have tried it more than once, as I suspect flavours vary for reasons such as the genes of the individual plant, environment, and ripeness. I appreciated the taste when I did try it, but I wasn’t in agreement with Queen Victoria, for whom it apparently became a favourite fruit. The Plants for a Future database extols its virtues as well: Ugni molinae. Chilean guava or strawberry myrtle is native to the temperate rainforests of central and southern Chile and adjacent Argentina. It is a small evergreen shrub to 1-2m (3-6ft.) in height. Plants flower prolifically, as you can imagine by the number of fruits in today’s photograph. Looks quite yummy to me. Lovely color in the photo – kudos. Beautiful combination of colors! Nice job capturing that beauty. Since the S.F. Bay Area shares Mediterranean climates with Chiloe, there is a lot of Ugni used successfully as hedges and specimens. Those berries are exotically tasty – for some reason reminds me of something from the Holidays…..
Quin Ellis, know where I can buy specimens of Ugni? I’m in San Rafael. Thanks. Little Prince of Oregon Nursery (in Aurora, OR) grows it! That is just so beautiful and delicate looking! It looks so much like the “Sweet Shrub” we have here in South Carolina. Beautiful scent. Queen Victoria’s favorite fruit? I love the history lessons we get from you, Daniel. Thank you! I had a bush covered with berries from a green house flowering. For one month I would walk past the plant and be captivated anew by the scent of strawberries. I hated to harvest it but in the end I did. The berries tasted like the strawberry filling in See‘s chocolates! It still grows in my garden (west Germany) but it has never flowered. I hear it is a pest in South America. Such a delicious pest would be more than welcome to take over well, a section – of my garden. AMAZING CAPTURE!!!! LOVE UGNI FRUIT!! !